Ideally located between the Atlas and the ocean, Hostel Kahina and its staff welcome you for an unforgettable vacation in Imsouane. You will enjoy the wonderful sceneries and peaceful ambiance while surfing one of the best Moroccan waves. For you sports fans, rides along the coast and the cliffs are possible, you will discover little corners of paradise offering peace and serenity. 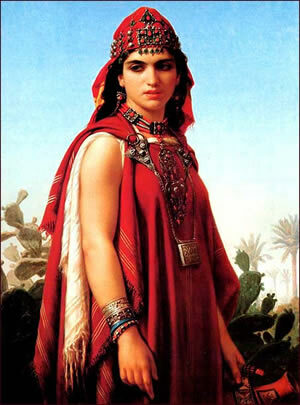 The KAHINA, whose real name Dihya or Dyna and Damya called Tadmait was the daughter of Matiya Head of the Djrawas tribe, who lived in the Aures (current region Chaouis). From a very young age, KAHINA revealed a fiery temper and a reckless spirit. From a very young age, KAHINA revealed a fiery temper and a reckless spirit. She was very good rider, practicing archery and address competed with the best shooters and riders of her tribe. A little later she is also known for her wisdom and often consulted to arbitrate and resolve in difficult cases. After the death of her father, she proposes a candidate for the succession. She will then marry a candidate, apparently of high rank, with whom she has two boys, Ifrane (Mesraïm) and Yezdia (Slimane), and then became head of her tribe. The legend says that she had a major plus at her nomination as chief. Indeed, legend tells us that she had the gift to predict the future... Also KAHINA means in Arabic "prophetess" or "Soothsayer". Some gossips claim that it means witch but it seems that the name of Arabic is nothing pejorative, because at the beginning, the term derives from the Hebrew Cahen, Cohen which means priestess being pure Greek. But the KAHINA had to use all means to achieve the status of leader, the myth did the rest. She certainly wanted to revenge the death of her father and at the same time stop the conquest of her country by new invaders. She put all her energy and all her powers of conviction to combine a large number of warriors from different tribes of the Aures. And she will lead them to fight like a real general. The war erupted between the Berbers and the Umayyads. For the Umayyads side is Hassan Ibn Numan who took command in 695.The first major battle between KAHINA and Hassan will take place in Miskiana between Tebessa and Ain Beida.The KAHINA just won her most prestigious victory, that of Meskiana, be called "Battle of the Camel . After his defeat, Hassan asked for more men to the Caliph Ibn Marwan to attack the Aures. The KAHINA engaged once more in battle in 702 back to Tabarqa. The KAHINA knew the imminent defeat and asked her sons to to convert to Islam and join the Arabs. Hundred thousand Berber were massacred by Hassan in the Aures. The defeat of the KAHINA’s troops is partly due to treason of Khalid, a young Arabic that the Queen had saved and adopted according to the custom of Anaiah ("protection"). Finally, the Queen is captured and beheaded at a place called Bir El Kahina (well of the KAHINA). Her head was sent as a trophy to the Caliph Malik Ibn Marwan. Despite everything Hassan kept a great respect for KAHINA that he would never beat without reinforcements and some betrayals. Hassan confides to each son of KAHINA command of 6000 men. Sons of a real warrior, they were also great warriors. And they will become the defenders of Islam in the Maghreb. The rest of their story will be written with the conquest of Morocco and Spain.